The Pardee RAND Graduate School’s Alumni Leadership Award is designed to recognize prominent alumni who show passion, leadership, and discipline in their careers, and who have made exemplary and important contributions through public service and to public policy. It highlights the extraordinary work that Pardee RAND alumni are doing across the globe, working to be the answer. Awardee contributions may take place over the course of a career, and the award is presented biennially during Pardee RAND’s Commencement Weekend. Sharon Arnold (cohort '85) received Pardee RAND's fourth Alumni Leadership Award during Commencement Weekend 2018. She sat down for a Q&A about her experience at the School and how her time at RAND has influenced her career, and also spoke at the Celebratory Dinner on Friday, June 15. 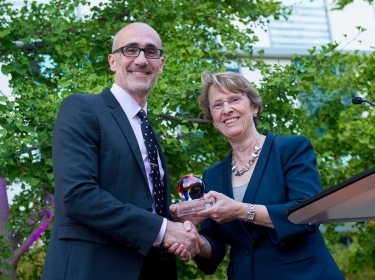 Arthur Brooks (cohort '96) received the Pardee RAND Alumni Leadership Award during the 2016 Commencement Weekend in June. 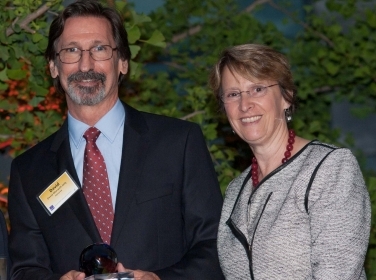 Mark J. Albrecht (cohort ’73) is the inaugural recipient of the Pardee RAND Alumni Leadership Award. 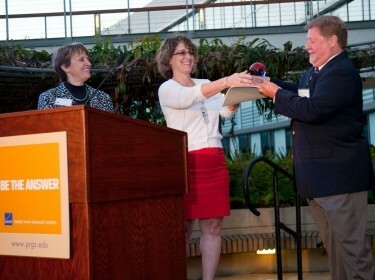 The award was given on Friday, June 22, 2012, at the Celebratory Dinner during Commencement Weekend. We may not be presenting another Alumni Leadership Award until Commencement and Alumni Weekend in June 2020, but you can recommend a nominee any time! Email Chandra Luczak (cluczak@rand.org) with your suggestion today!